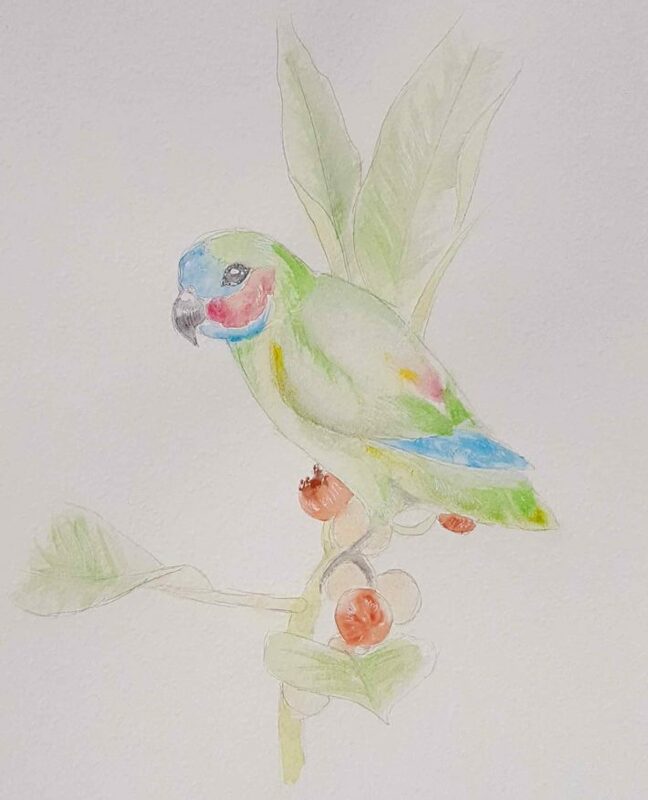 Home / Articles, Environment, Latest News, Local Interest, Sustainability / The rare and beautiful Coxen’s fig-parrot – How you can help! Is this South East Queensland’s rarest bird? The Coxen’s fig-parrot (Cyclopsitta diopthalma subsp. coxeni) is arguably South East Queensland’s rarest bird, with only a handful of sightings having been made (in secret) in the past decade to reporting authorities such as BirdLife and the Queensland Government. This species is apparently only just hanging on in the most untouched tracts of rainforest in our hinterland parks and reserves, ranging from the Gold Coast and Northern Rivers region of NSW to Queensland’s Fraser Coast. This beautiful bird is truly stunning to look at, with a striking lime green body and dainty red, navy and sky blue markings on its face and wings. The Coxen’s fig-parrot is one of our smaller parrots, reaching a maximum of only 15cm in length, with a very short tail and somewhat rounded body shape. The Federal Government of Australia recognises an estimate of only 100 breeding birds left in the wild! And this number is thought to be in a state of continuing decline. The Coxen’s fig-parrot is listed ‘Critically Endangered’ by the International Union for the Conservation of Nature (IUCN) and New South Wales Biodiversity Conservation Act 2016, and as ‘Endangered’ under the Federal Environment Protection and Biodiversity Conservation Act 2000 and the Queensland Nature Conservation Act 1992. Why is this beautiful parrot struggling to survive? It is thought that severe fragmentation of suitable rainforests containing multiple mature fruiting figs is the main reason for the species’ decline. It is likely however, that the bird was always quite scarce and existed in highly nomadic sub-populations that travel over a relatively larger area of South East Queensland. With so few large undisturbed patches of rainforest (Lamington, Springbrook and D’Aguilar National Parks are good examples) the parrots have suffered a significant decline in numbers. As their name suggests one of the keys to this parrot’s persistence in the wild, is the availability of native fig trees. The life-cycle of the fig tree is quite remarkable in that firstly a flowering fig must attract a pregnant female fig wasp. This wasp will enter a small cavity at the tip of the fig body and inside it will find a whole host of female flowers which the fig wasp will burrow into, rubbing off pollen from a previously-visited fig as she does so, and lay her eggs. The young wingless male wasps will hatch and mate with a female, they will then excavate a hole for the female to exit before dieing. The winged females leave the fig and begin their journey to start the whole cycle again at a new tree. Once the figs are pollinated they ripen and swell. The sweet ripe figs then attract a variety of animals that will feast on them. These are often colourful fruit-doves and pigeons, who now become responsible for dispersing the seeds that were inside the ripe fig, throughout the rainforeat. The figs are delicious to eat, and when a large forest fig is bursting with fruit, it becomes a Mecca for these frugivorous birds. The birds will gorge on figs and fly large distances (certainly in the case of the Topknot Pigeon). Once digested, the birds will leave their droppings on a branch of another tree. From here starts the most sinister part of the fig tree’s life. With a small pocket of nutrient from the bird’s dung, the young fig seeds deposited have a burst of energy to send a long tap-root down from the tree-branch many metres from the canopy to the forest floor. 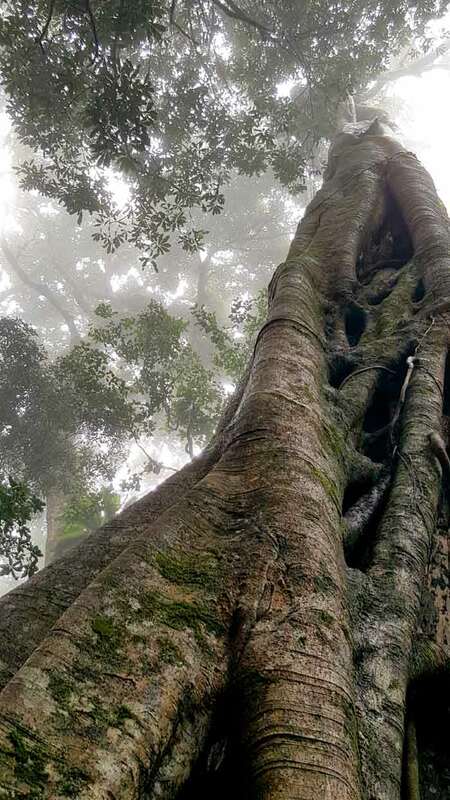 Once it reaches the earth the root will begin extracting nutrients and water from the soil and feed the young sapling growing high up in the canopy. As it does so, the little tree will grow and the roots will swell forming a lattice network of larger, harder roots around the trunk of the host tree. These slowly over many decades thicken, broaden and tighten, gradually puncturing and asphyxiating the bark of the host tree, until eventually it dies, essentially having been strangled to death! Once the fig tree reaches maturity, often following many hundreds of years of “assisted” growth from the host tree, it will flower and fruit. This starts off a whole new generation of the fig, wasp, fruit-dove interconnected life-cycle once more. And it is this complex life-cycle that the Coxen’s Fig-parrot relies upon in order to feed, breed and survive. Sadly due to the rapid growth of cities like the Gold Coast, slowly spreading up into our hinterland valleys, untouched swatches of rainforest dotted with large fruiting figs, are rarer and rarer. And for this vulnerable, tiny parrot and the resources it needs to survive, the option of living anywhere near a city or around our urban areas is just not possible. So they confine their dwindling populations to the furtherest reaches of our subtropical rainforests, and remain there in secret isolation. But what can YOU do to help the Coxen’s fig-parrot? Well in fact you can help because throughout 2018 Natura Pacific is giving away FREE FIG TREES to help support the survival of the Coxen’s fig-parrot! If you have a large enough block of land or garden (minimum 1 acre) to adopt a fig, you could be helping to add important “fuelling stops” to the network of figs available for these extremely rare parrots. This is especially true if you live in a more rural setting, where you could possibly even attract a small group to your garden (if you are really lucky). Failing that, you will be providing much-needed native fruit to a whole range of other precious native wildlife such as Australasian Fig-birds and of course, our lovely fruit-doves! Besides, fig-trees make stunning specimens, and as long as they’re given heaps of space and some watering to help them establish after planting, they are very easy to look after. 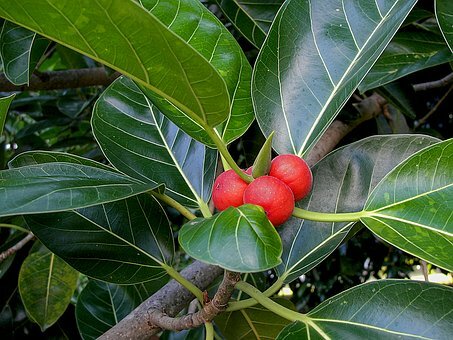 Why not help us support the survival of the Coxen’s Fig-parrot today, by visiting our office at 2/55 Dover Drive, Burleigh Heads, Gold Coast and grab your very own free fig-tree! 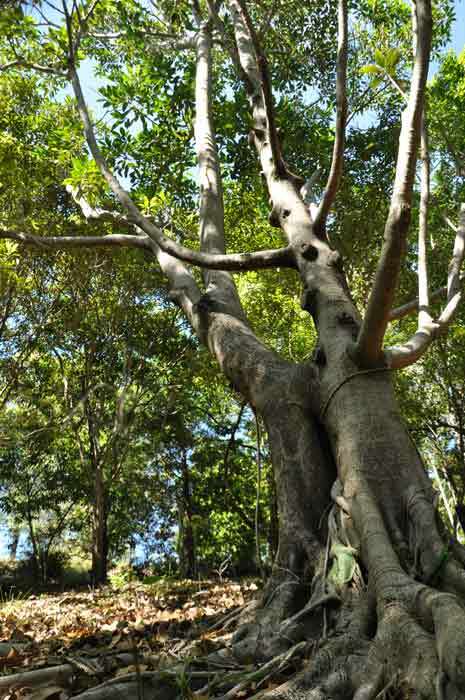 We have the Small-leaved Fig (Ficus obliqua) and the Port Jackson Fig (Ficus rubiginosa) available to give away. These trees have been generously supplied by the Gold Coast branch of the Queensland Native Plants Society. Give us a call on 07 5576 5568, email us at info@natura-pacific.com or follow this link to get in touch.